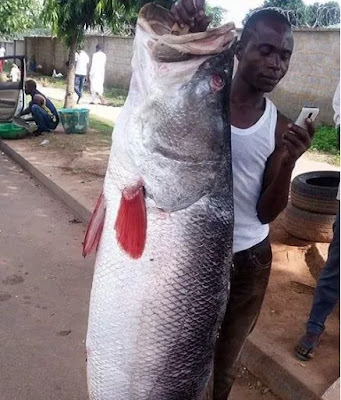 A huge fish found on the streets by a Facebook user has got social media talking. Facebook user, YomiNigeria, took a selfie with the fish which had been displayed on the streets for sale. “Hey guys, my weekend is fulfilled. See what I found by the roadside; a fish taller than a man,” he wrote. Many social media expressed fascination at the size of the fish which appeared to have been hung on a heavy stick.